Ateljé was designed especially for the newly renovated Nationalmuseum in Stockholm 2018. Adaptable to suit everything from banquets and weddings to lunches, it was specifically made for the museum’s main dining hall called Ateljén. Inspired by traditional equipment in an artist’s workshop, it aims to reflect an artist’s creative process and provide flexibility. The rounded ends give the table an inviting feeling and reinforce its own identity, but above all it makes socialising easier. Even just two people can sit at one end and enjoy a conversation. Sitting as a group, and not in a row, also creates a greater sense of togetherness for both small and large gatherings. Ateljé has an extendable top making it suitable for all kinds of functions. At full length, the table measures two and a half metres and sits 10 persons, compared to the standard layout of eight. While most other tables bend when extended, Ateljé maintains stability due to its sturdy construction and adjustable beam. The robust beam plays a central role for Ateljé, both aesthetically and functionally. It is inspired by workbenches and adjustable tools in an artist’s workshop. The beam has two tracks. 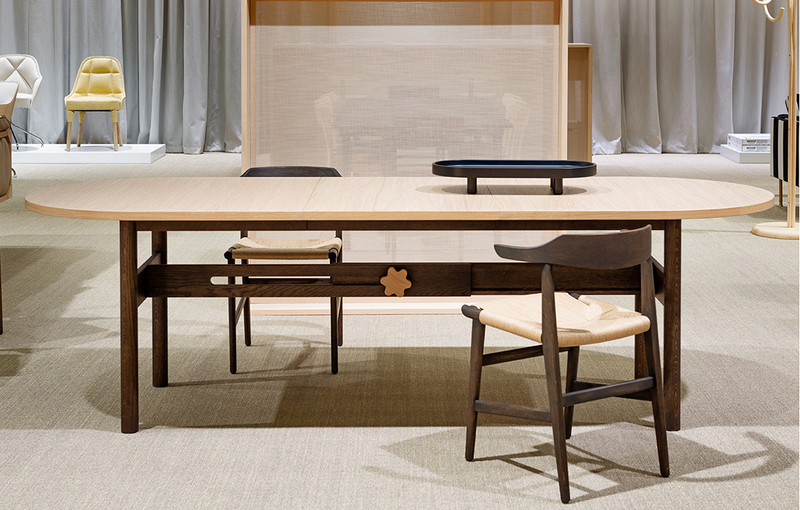 The main one guides the thread, which creates the beam’s silhouette, while the minor one ensures the table does not sag. 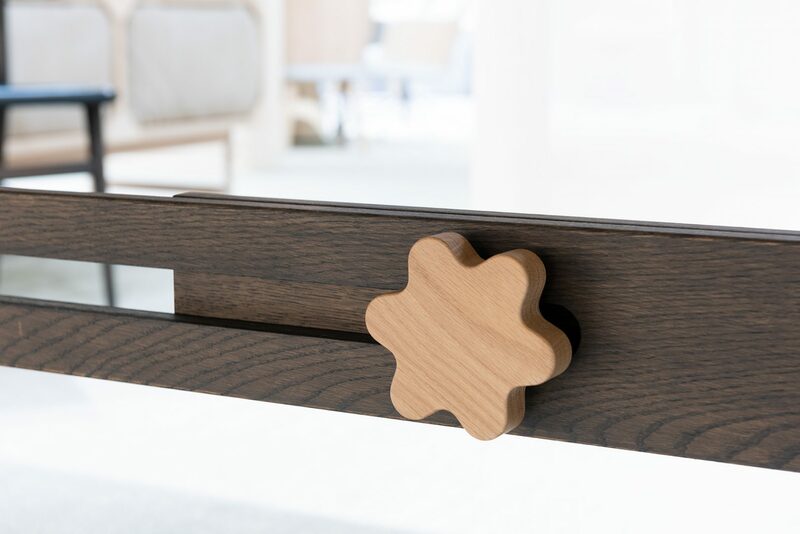 Even the knob that locks the beam in position is inspired by adjustable tools. As a central part of the construction, it too has been given a distinctive design making it the very icon of a knob. As the beam has a low position, the eye-catching knob appears almost like a flower under the table, while the rounded cogs make it easy to grip. The accompanying tray was inspired by Asian dining where a raised portion of the table may be used during service. With shape and proportions mirroring the larger table, it becomes a natural addition that can be used as a serving tray or small side table. 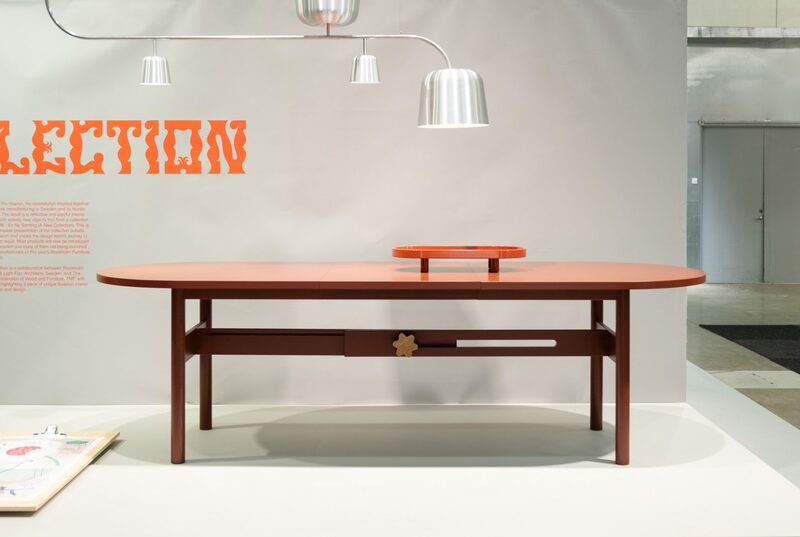 Or as a partition to create intimacy, when several parties share the same table.